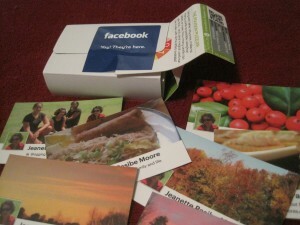 I received my FREE facebook cards today from MOO and are they ever fabulous! Well, I shouldn’t be surprised. I’ve had MOO products before when I received the mini-MOO cards from Foodbuzz. These facebook cards were pulled from my facebook timeline. 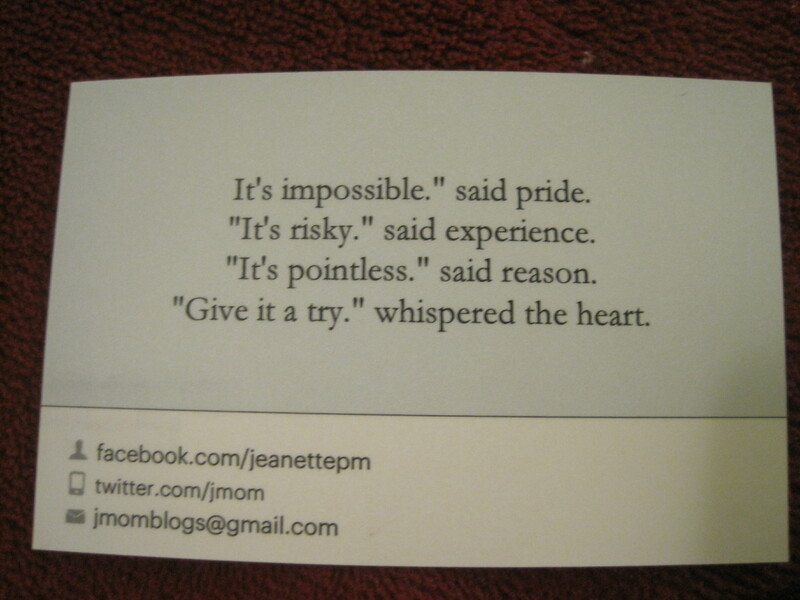 It pulled the cover photos I had already uploaded and even pulled one of my quotes for the back of the card. Even though the photos were my own taken with my cheap point and shoot camera, the images on the card came out vibrant and looked like they were taken by a pro! And the paper… it’s heavy stock paper. None of that flimsy kind that looks like you could have printed it yourself on your color printer. These had body to them. The kind that won’t crumple when you casually drop it into the abyss of a woman’s purse. They are so thick and sturdy that you’d want to hold on to them… maybe even frame them! Want to try them out? 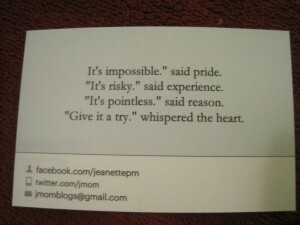 They are still offering free facebook cards just go on the moo.com website and find out how. You can also check them out on facebook. Wow, thanks for this tip. They shipped me a pack of 50 for free, just like you said, and all of this on 16pt stock paper. I had to pay shipping, but it wasn’t significant. At MOO we love big images: the bigger the image, the better the print. And the more interesting the image, the better the impression it makes when you first hand your card over to anyone you meet.